Yesterday was Sonzee's 5-year-old sister's birthday celebration. It was a planned "girls only" party. 8 girls including the birthday girl were going to spend the morning getting their hair, nails, and makeup done. My heart yearned for an inclusive experience for Sonzee. I was apprehensive from the time of booking how this would play out, but I knew it was out of my hands. 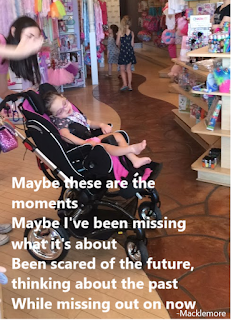 I have learned to set the standards high for Sonzee, but to keep my expectations low to protect myself from the potential pain that comes with the "special needs life disappointment". So, when we arrived at the facility and the girls began to rotate into their respective stations I continuously mentioned that we would try Sonzee, but that it was okay if it did not work out. I yearned for her to take part without it being stressful for her, without her being upset, and without me wishing the outcome had turned out differently. Finally, it was her turn. I was nervous about how the staffing girls doing hair, makeup, and nails would react to her continuous body movements. 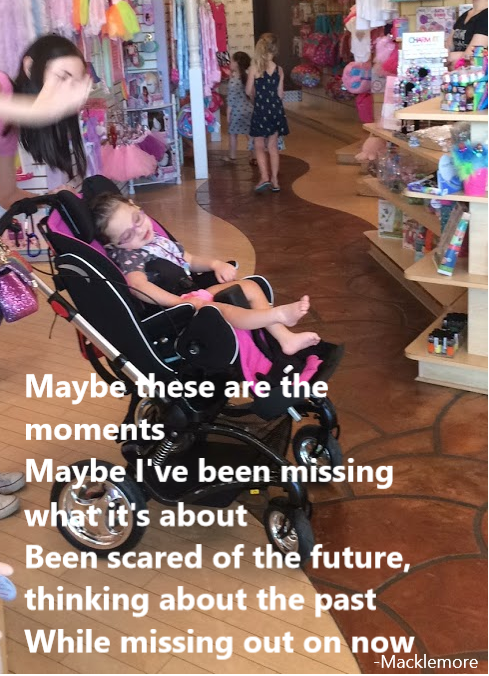 It did require Sonzee's sister and myself to hold her hands and feet to get her nails done due to her kicking her feet around and her desire to want to eat her fingers throughout, but once she realized she was being pampered she settled right down and only got a little nail polish on her shorts and inner thigh. She did not argue one time while the girl put gel in or combed her hair, or spent time doing a french braid side pony tail. She loved the glitter shower at the end. I helped make a beaded necklace with her, to be honest she was not overly thrilled (but those beads are tiny, and I honestly do not care for the patience it takes either). She danced with her sister, and it brought me such an immense amount of joy watching her be included. The staff included her, the girls included her, her sisters included her. My heart was not prepared for the amazingness that occurred. Lately things have not been the best. We try to focus on the positive, but the weight of CDKL5 has been increasingly heavy over here. There is the false sense of security because things have been going okay with the big picture, but the little things are what make the floor fall out from under us in an instant. When will that happen? The uncertainty of everything remains only a small thought away, and it takes a toll the further into this journey we travel. It is easy to get caught up in that ball of yarn. Yesterday while celebrating the past 5 amazing years I was reminded about happiness and joy. I was reminded that life passes by in an instant and it will not be slowing down. I was reminded about Sonzee-stones, simplicity, and the little things. I was reminded that there is nothing I can do about the future, nothing I can do to fix the past, and that I need to be present in the now.